European Union commissioners have ruled that Britain can carry on using imperial measurements such as pints, pounds and miles. Europe's Industry Commissioner Gunter Verheugen said: "There is not now and never will be any requirement to drop imperial measurements." The decision will not affect current law on metric measurements, but means imperial equivalents can be used too. It follows years of wrangling between London and Brussels over metrication. The commission has kept extending the deadline for the UK to complete the full transition to the metric system, with the most recent deadline being 2010. This would have meant setting a deadline for ending the traditional delivery of pints of milk - and the sale of pints of beer in the UK's pubs. Every one of the UK's road signs would have had to be changed from miles to kilometres - a move which opponents warned would be both expensive and confusing. 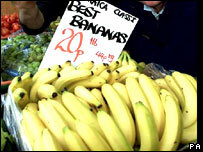 But it was the move, begun in 2000, to make the UK's market traders sell their produce in kilograms rather than pounds and ounces which caused outrage among traditionalists. 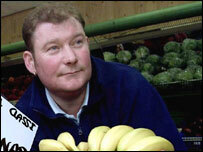 Sunderland grocer Steve Thoburn inspired the "metric martyr" movement with his defiance of the order to abandon the imperial measurements. In 2001, he was convicted for having weighing scales which had only imperial measurements. Under the plans which have now been scrapped, even displaying the price of fruit and vegetables in pounds and ounces would have become grounds for a criminal prosecution. Mr Verheugen's role includes trying to improve the EU's reputation in member states - and in an interview with the BBC, he admitted the EU had been making itself unpopular on an issue that did not really matter. "I organised a huge consultation, and the result was that industry told us there was no problem with the existing system. However, campaigners on both sides of the debate have played down the significance of the announcement. John Gardner, director of the pro-imperial British Weights and Measures Association, said: "I've seen the European Commission statement and what they're saying is it will be allowed to use imperial measurements as additional information. "We think that the European Commission statement is extremely misleading. From our point of view the situation hasn't changed and the campaign goes on. "If a trader tries to conduct his business in just imperial measurements that will be illegal." The UK Metric Association said the statement does not mean that traders can go back to weighing and pricing in imperial measures, and it will be "business as usual". Chairman Robin Paice said: "While we regret this proposal to prolong the current muddle of metric and imperial units, it will only delay but not stop the inevitable move toward all-metric shopping. "Many of the big supermarkets have already stopped giving obsolete imperial prices, and we expect this trend to continue. There is no question of going backwards." Science and Innovation Minister Ian Pearson said he welcomed the commission's proposal. "This shows that the commission has listened to our views and recognised the strong arguments that we've made for maintaining dual metric and imperial labelling and the right for the UK to decide on the future use of pints and miles," he said. "We know how important this is to the British people and are grateful for the commission's support for this use to continue." The UK first mooted plans to convert to an all-metric system in 1965. That led to generations of schoolchildren being promised that they would be the last ones who would have to learn two different systems. Which system do you use for measuring? Will we ever go completely metric?